Earlier, I got overenthusiastic and gave away the ending to someone I was telling about the show, so I shall endeavor to be spoiler-free here. 11 year old Albert (Alejandro Vega) has a problem. His dad (Bob Beverage) went missing three weeks ago. And there’s a monster in his basement, which his mom (Lara Trujillo) keeps going down to check on, armed with a lot of paper towels. Meanwhile, a new girl his age, Cassie (Mary Bair) moved in next door, and immediately decided to invade his tent refuge in the backyard. Cassie is smart and resourceful, and it doesn’t take long for her and Albert to decide they are going in search of Albert’s father, even if that means confronting the monster in the basement. A quartet of other actors (Cat Brindisi, Derek Prestly, Grant Sorenson, and Kendall Anne Thompson) play everyone else from the family dog to Cassie’s military mom. Mostly, though, they play the house, which sings, reinforcing an 11 year old boy’s sense of wonder as he goes on a journey to discover that growing up means sometimes there are things to be afraid of that aren’t just imaginary. 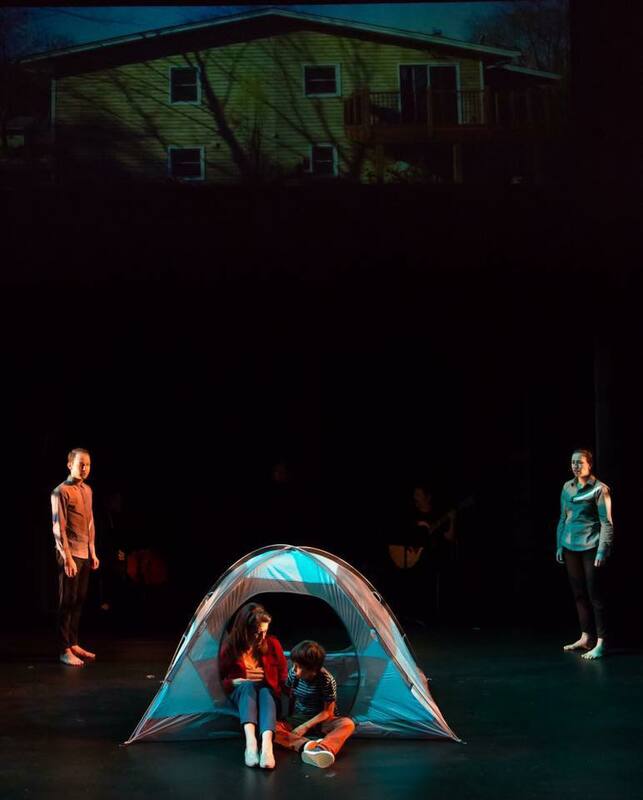 The Passage, or What Comes of Searching In The Dark perfectly captures what it’s like just before and just after, a child starts to grow up (granted, some children are forced to grow up a lot faster or a lot sooner than others, and there’s a fair amount of white privilege built into the foundation of this family home, but a passage is a passage). The definition of what it means to be a hero, for both parents and children, and even the family dog (whose last line just slays me), evolves over the course of the story. The monster in the basement is coming for all of us, one way or the other, and you’ve just gotta pray that there’s someone willing to grab a roll of paper towels and come to your rescue. My mom was down in that metaphorical basement with my grandma four years ago. My stepmother is down in that basement with my father right now (Bob Beverage’s resemblance to my father at the end of the show is a little unnerving). I don’t know who’s coming down into my own personal basement one of these days, but I have to hope there’s someone. The moment The Passage completely took over my brain was when two characters were at last meeting face to face. It was near the end of the show. I felt like the scene might be coming to an end soon. But something still hadn’t been said. And I realized I was kind of leaning forward thinking to myself “Tell them that you love them, tell them that you love them, tell them that you love them…” and I couldn’t relax until they did. And when they did it was an enormous relief. Honestly, I’ve been having some trouble with theater lately. So much of what I’ve seen was adequate but not compelling. Sometimes puzzling, or far too in love with itself (totally forgetting the audience), or worse yet, completely unnecessary. So when I see productions like The Oldest Boy or The Passage, they are a reminder. This is theater that knows what it’s doing. This is theater that knows why it’s here. These are artists who have something urgent to say, and a way of sharing it that draws the audience in rather than holding them at a distance. This is theater that is entertaining and big-hearted, but also smart and very necessary for the times in which we’re living. This is the reason why we tell stories. This is why we sit down and listen to stories. Writing Challenge 2016 #14 - Guns!